At an estimated $4 billion, the 2014 elections were the most expensive Congressional midterms in history. 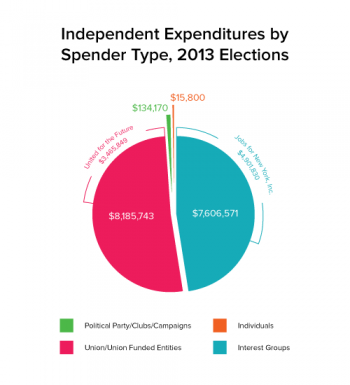 In the wake of Supreme Court decisions like McCutcheon v. FEC, independent spenders are spending increasingly large amounts of money in an attempt to sway national, state, and local elections. Perhaps most alarming is the increase in spending by groups that are not required to disclose their funding sources. According to the Center for Responsive Politics, these so-called “dark money” groups spent at least $170 million to influence congressional races in 2014. Dark money groups spent “at least $1 million” in 13 House races this fall and accounted for more than half of all independent spending reported in an additional 17 House contests. But New York City is leading the charge in requiring full disclosure of funding sources for political spending. In 2012, the CFB put into place rules barring anonymous independent advertising in city elections. These rules implemented changes to the city’s Charter that were approved by voters in 2010. In August, the New York City Council adopted and Mayor de Blasio signed into law strong, additional disclosure requirements. Local Law 41 of 2014 now requires spenders to provide greater details about the sources of their funding so the public can follow the money. Under the law, organizations that make independent expenditures will disclose the names of their owner and CEO. Spenders will also disclose information about any contributor who gives more than $50,000, including the names of owners, executive officers and board members of any contributor organization. Spenders must also list their top three donors on campaign literature or paid advertising directed at NYC voters. “The whole goal is to enable voters to see who’s behind the ads they’re getting,” said Council Member Brad Lander, who sponsored the legislation. To help independent spenders comply with the law, the Board is writing new rules to provide more clarity and establish clear requirements for what must be disclosed, including specific rules for determining who the top donors are. To make this process simpler, the CFB will add a feature to its disclosure system to figure out the exact wording required on each communication to ensure that spenders get the notice right. These regulations are key to reducing the influence of the big money spenders that spent $16 million on New York City’s 2013 elections and flooded airwaves around the country in 2014. Allowing the public to see immediately who is funding political ads is a critical step to ensuring that voters have the most influential voices in New York City’s elections.